Although the Faith Feminisms link-up officially ended on Friday, I wanted to write one last post about the intersection of faith and feminism. Since I was on vacation this week, I found it hard to find time for blogging. I mean, who wants to blog when the beach is calling to you? So, a bit late, here is my last #FaithFeminisms post. A little over a year after we first began attending the Orthodox church, my husband, daughter, and I were chrismated into the Orthodox faith. (Chrismation is a sacrament of being anointed with holy oil, or chrism – basically, it means we joined the church.) Before we were chrismated, we each had to choose patron saints. For our daughter Madeleine, we chose Mary Magdalene, a friend and follower of Jesus, the first person to whom he appeared after his resurrection, and a woman named Equal-to-the-Apostles because of her evangelism. (Have you ever heard the story of Mary Magdalene and the red egg? It’s why we crack red eggs at Easter.) Steven chose St. Maximus the Confessor. I had a hard time choosing a saint. I was a new mother at the time and wanted a saint who was a mother. I scoured the internet for female saints and spent hours on the phone with my Orthodox sponsor, who offered many great suggestions. I finally chose St. Nonna, who is not a particularly well-known saint, but she was the mother of three saints, including the well-known St. Gregory the Theologian, who is one of the Cappadocian Fathers. Her son spoke highly of his mother, saying that through her prayers she converted her husband from paganism to the Christian faith. “What time or place for prayer escaped her? This was the first thought of her day,” St. Gregory said of his mother. Nonna was a woman of faith who prayed for her family and and led them in the faith. “While some women excel in the management of their households and others in piety—for it is difficult to achieve both—she nevertheless surpassed all in both, because she was pre-eminent in each and because she alone combined the two,” her son also said. At the time, I was trying to balance teaching, family life, and spiritual life, and feeling like I wasn’t all that successful at any of it. St. Nonna inspired me. St. Gregory also spoke of his parents’ marriage, comparing them to Abraham and Sarah, and saying that “They have been one in honor, one in mind, one in soul . . . They are equal in prudence and splendor.” It seemed that theirs was a marriage of partnership and equality, which also attracted me to St. Nonna. Could I be a wife, mother, and Christian like her? On the day we were chrismated, I got my new name: Nonna. Now I hear it every week when I take communion and my priest blesses me. I remember it when I am in a particularly difficult parenting moment. I remember it when I take the time to pray and I find myself in front of her icon. Does choosing a saint for her wifehood and motherhood make me less of a feminist? No. Feminism should not devalue women for raising their families. St. Nonna is a treasured woman who has much to teach me. 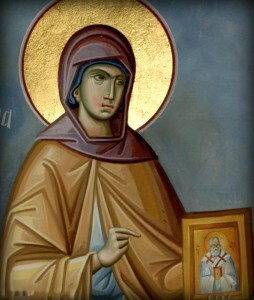 Now ten years into Orthodoxy, there is another female saint who has caught my attention in the past couple of years: Mother Maria of Paris (also known as Maria Skobtsova.) She has a pretty incredible story, and there’s not room to recap it all here, but you can click the link to read the longer version. Mother Maria was a twice-divorced, smoking, drinking Orthodox nun. She tried living in a monastery, but it didn’t suit her. 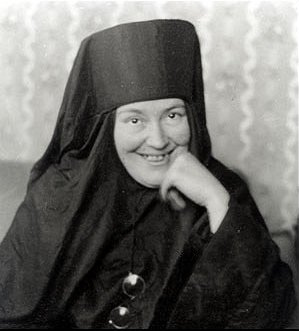 Instead, she created a “monasticism in the world.” She was a Russian expat in Paris, and she ran a large home where she rented out rooms to other Russian expats and ran a cafeteria that served food daily. She also started schools, ministered to mentally ill expats, and when the Nazis invaded Paris, helped Jews escape the city. She was educated and gave many theological talks, wrote and published poetry, and served as a confessor/counselor to many people who sought her listening ear, prayers, and advice. She struggled with grief, depression, and unbelief; when her father died when she was 14, she briefly became an atheist. She also lost a daughter to illness, after which she envisioned “a new and special, broad and all-embracing motherhood,” envisioning a “new road before me and a new meaning in life, to be a mother for all, for all who need maternal care, assistance, or protection.” This vision of being a “mother for all” is one of the things that actually brought me to call myself a feminist, and to believe that all women have a gift to give the world (whether or not they are mothers). St. Maria eventually was arrested for helping Jews and taken to a concentration camp, where she was killed in a gas chamber in 1945. Mother Maria of Paris inspires me just like St. Nonna does. Saint Maria worked tirelessly for the poor and oppressed and had little patience for piety. She was imperfect and a bit of a dissenter, and I love that about her. Mother Maria once said that “Each person is the very icon of God incarnate in the world.” I have tried to make that my own motto as I interact with other people, and I believe that the heart of Christian feminism is encapsulated within those words: the belief that all people are image-bearers and are valuable. These two very different women have affected my life in different ways and at different times. St. Nonna was there for me when I was rejoicing over new motherhood and longing to be a faithful spiritual mother to my child. Mother Maria was there for me when I was beginning to open my arms to feminism, and to the understanding that it was time for me to began to listen to the stories of others, of people who also bear God’s image, but who may not bear mine. St. Nonna taught me the importance of my role in my family and home. Mother Maria taught me the importance of my role in the community and world. One gave me the heritage of faith; the other gave me permission to question and rethink that faith. One gave me the gift of prayer; the other gave me the gift of living by my own convictions. Perhaps all these things seem to be at odds with one another, and maybe I am living in that tension between the two. But I would like to the think that if Orthodoxy gave me both of these female examples to live by, then it is okay for me to be both. That our lives will always be a bit paradoxical, that the pieces might not always fit perfectly, but that there is room for us to be people of faith and also be who we authentically are. Ask About Orthodoxy: Why Do Orthodox Christians Fast?